Christopher Monckton of Brenchley, otherwise known as the potty peer (among other things) is suffering memory loss. Well, he probably always was batty so this will not come as a surprise to anyone. Aside from being very late to the party, that's very odd for a couple of reasons. First it implies that Christopher Monckton was hoping for a "talking" book from the IPCC. Maybe so he could listen when he's on the train or maybe because his eyesight is failing. Could someone tell Christopher that there are software programs around that will read text aloud. All he needs is a computer with speakers or headphones and he can hear the sounds. @latimeralder @wattsupwiththat (1) This is the first 'prediction' the IPCC has made. (2) Observations within range of previous projections. The AR5 includes, for the first time, a specific chapter and assessment on ‘near-term’ climate change, which covers the period up to 2050, but with a specific focus on the 2016-2035 period. The IPCC has made a probabilistic assessment of how global temperatures are projected to evolve over the next 20 or so years, which is valid for all RCPs, but with a few caveats such as no future large volcanic eruptions. To find out more about the short term estimates for global temperatures, I recommend Ed Hawkin's blog article. Now Christopher rabbits on about "climbdowns" and "overestimates" which is nothing but wishful thinking on his part. He persists in using monthly charts of global temperature so he can hide the signal in among the noise of weather. It's going to get hotter if we don't do something about it. For some unknown reason, Christopher Monckton believes that future temperatures have either stopped or will proceed at exactly the same rate as they have over some period in the past or something else. It's never easy to work out just what the potty peer is trying to say. At one stage he was pushing for David "funny sunny" Archibald's "ice age by 2020" prediction. Australia has just broken multiple heat records, including 2013 being the hottest year on record. Large parts of the country have been suffering another near record-breaking heat wave, with known hot regions recording near highs (almost 50 degrees at Moomba). And it's not even been an El Nino year. It's a long, long time since there has been a "coldest year on record" - probably for almost any region on Earth that has several decades of temperature records, and certainly for the world as a whole. ...an increased probability of exceeding a 2 °C global–mean temperature increase by 2100 while reducing the probability of surpassing a 6 °C threshold for non-mitigation scenarios. The bottom line is that if we don't cut emissions of CO2 enough, the world will continue to heat up and that will pose a lot of big challenges to many people and in many fields of endeavour. Not least of which will be fishing, agriculture, food production, infrastructure maintenance, liveability in many regions and general quality of life and its affordability. People like poor old Christopher Monckton, who complains that the IPCC didn't provide a read-aloud version of its reports, and has forgotten that he first read the IPCC report months ago. He was even an "expert reviewer" at one stage but I guess he's forgotten that little fact - or forgotten that he's already written ad nauseum about it. 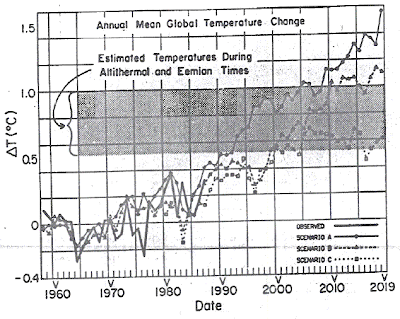 Which is similar to the actual chart from Dr Hansen's testimony, except Monckton's chart has the temperature in degree Kelvin for some strange reason and he's shifted around the labels. If you look at the charts above, neither of them go to 2050. Nor do either of them, under any scenario, show a rise of one degree in twenty years. Since 1960, Scenario A, which is the most extreme, shows a rise of almost 1.6 degrees to 2019. From 2000 to 2019, scenario A and B show a rise of around 0.7-0.8 degrees and nearly 0.6 degrees respectively. Of course that's not to say that over the coming century the global temperatures won't rise more quickly in some decades, or more slowly in other decades. The latest estimates suggest a rise of four degrees above temperatures in the early 1900s is quite on the cards by 2100 if we don't cut emissions enough. And it will continue to rise after that as long as we're adding CO2 to the air in greater quantities than it's removed. Here are the longer term projections for different choices we make about how much CO2 we will throw into the air. Christopher's getting on in years like me, so he may not suffer too much. So he can go gallivanting about complaining that he isn't allowed in the House of Lords and doesn't believe that Obama is President of the USA and that he's found a cure for AIDS and other crank ideas, like global warming isn't happening. And Anthony Watts can promote as many crazies as he wants to on his anti-science blog. It won't change a thing. January 1, 2014 at 6:55 pmHear, hear, Christopher Monckton. Well done! Thank you for the truth-in-science tour de force. ...They must think we’re a bunch of morons. Yep, Janice. For once you hit the nail on the head! ...So, why do all of the graphs seem to show some global warming over the last 17-18 years, when several postings have said that the data show no global warming over that period? I’m not trying to be annoying; I just don’t understand. I can't believe I wish this...but I wish Mr Monckton was a young man again. Then he may live to experience the grief, horror and destruction his denial campaign helps contribute to our situation. I don't like to think that way partly because it creates negative energy. I guess that's one of the reasons I have this blog - to negate the influence of clowns like Christopher and Anthony by pointing out how pathetic and ridiculous they are. In any case, people in such deep denial would never accept global warming no matter what happens. Record fires behaving in ways they've never been known to act before, flash floods, record droughts and heat waves - they'll just say it happened in the Jurassic so it's not "unusual" - or similar nonsense. Just take a look at the editorial in The Australian today - telling lies about the Turney expedition to downplay global warming. While elsewhere in the news, Australia has just broken umpteen heat records, including the hottest year on record. And a huge area of the continent is only now being promised relief after a mammoth heat wave with near record temperatures. And all this without the help of any El Nino. I doubt anyone of any importance would take Anthony Watts or Christopher Monckton seriously. When I get downhearted I go to the Climate Council or ClimateProgress or Bloomberg Sustainability or similar to read about all the good things that are happening (admittedly not enough yet). BTW: A temperature increase of 1 K is the same as a temperature increase of 1 °C, since the two scales differ only by a constant; T(K) = T(°C) + 273.15 K.
Aha, but do you see what he's done? By using deg K he can capitalise on the non-decimal alignment in the two scales by making the temps on his chart ~.15C cooler! What a flaming idiot the guy is. Well, it is *Delta* T, and the baseline is the same (zero at 1960), so the scale change doesn't matter. metzo, I am no apologist for the potty peer, but please note that the two scales differ only by a constant, so ΔT is the same in K and °C. Yes, I know that, Jim. I was just noting it because science deniers seem to have a preference for the Kelvin scale (when they aren't using Fahrenheit). I also think it's odd to change someone else's historical chart in any way, even though it makes no substantive difference. I'm not sure, but in some of his later charts are the differences in slope due to the baselines? He compares calculations of slopes to IPCC reports going back some time, but those earlier reports must have used baselines of e.g. 1960 - 1980, while the new ones use baselines from 1981 - 2005. Does that make a difference to slopes on a 30-year timeframe? Shouldn't, but since he is a serial liar I would not be surprised if he fudged the data. Apologies, Anonymous. I glossed over his charts and didn't bother reading that bit at all. Different baselines shouldn't make any difference to slopes. However as Rattus points out, it's best to check the source documents because Christopher has a habit of misrepresenting data - particularly when it comes to IPCC projections. He'll do things like shifting the start up, or drawing random lines that have no similarity at all to anything from the IPCC. Delighted to see the recent uptick in the WUWT faithful coming over here to add to the comedy. 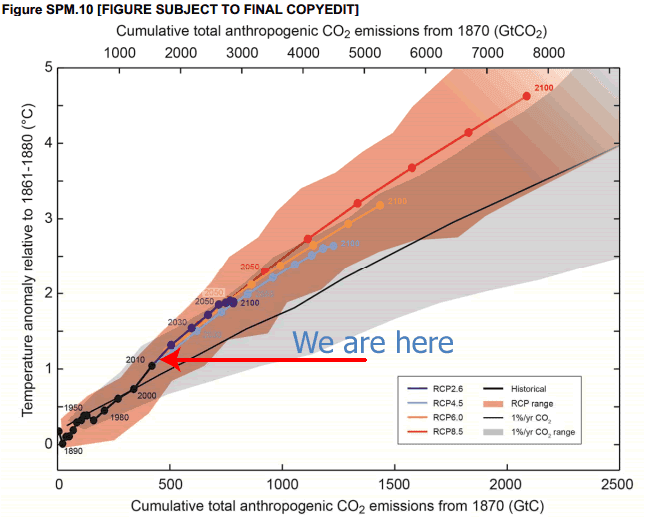 Monckton's main trick is to compare observations to Hansen's scenario A, which is predicated on exponential CO2 growth. 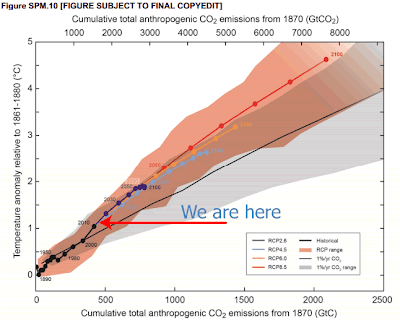 CO2 increase has not been exponential, but linear. (Closest to Scenario B). "If you look at the charts above, neither of them go to 2050. Nor do either of them, under any scenario, show a rise of one degree in twenty years." If you bother to look you will notice figure 3b shows Scenario A the business as usual scenario (which actually underestimates current emission growth using a figure of 1.5%) going all of the way out to 2060 and predicts a rise of 4.2 degrees C above the 1951-1980 mean, a rise of , let me see, ah yes 1 degree per 20 years! So while Hansen may not have actually conveyed the prediction verbally the research on which the testimony was based and was freely available to any member of Congress who was interested certainly did. Perhaps that is due to lack of research skills or perhaps the fact that you see only what you want to see. If you read through the paper you cite, and get as far as Section 4.1, you will perhaps realise how stupid it is to compare the current scenario to Scenario A.
Alternatively, you could try reading the comment immediately above yours. P.S, Nice internet handle. Is it okay to call you Epic, or do you prefer Dr Fail? 1) You sent us to a PDF of Hansen's testimony that does *not* include a figure that goes out to 2060. If Monckton wanted to make the point that Hansen predicts 1 C/20 years, he should have shown that figure. But then he'd have to admit that Hansen didn't predict 1 C/20 years up to 2020. In Hansen's paper, for Scenario A, the rate doesn't reach 1 C/20 years until about 2030. In the figure that Monckton cites, even Scenario A dT/dt for 2000-2020 is only about 0.5 C/20 years. 2) You don't seem to understand "scenario". Hansen gave 3 scenarios intended to cover the full range of possible emissions. He didn't state that any one of them was right. 3) Hansen's Scenario A isn't the right comparison. Hansen applied scalings to account for non-CO2 GHGs, just doubling the radiative forcing (RF). But CFCs are now close to zero, and methane didn't grow much. Net RF since the 1980s is closer to Scenario B. 4) Central equilibrium sensitivity is about 3 C: Hansen et al (1988) used 4. Monckton could avoid looking dishonest by engaging directly with actual scientists in a spirit of mutual learning. So could his followers. To Epic Fail - If Monckton wanted to reference another paper he would have done so. He said "Dr. James Hansen of the Goddard Institute for Space Studies told the U.S. Congress in June 1988 the world would warm by 1 Cº every 20 years till 2050 (Fig. 1), implying 6 Cº to 2100." Now you say that Monckton meant something completely different to what he wrote. Maybe he did mean something different, but I conclude he lied so he could pretend that Hansen said what he didn't say (in writing or verbally) to the US Government rather than in his jointly authored published paper. Now you, Anonymous (the top one who goes by the name of Epic Fail) have referred to Fig 3b in the paper you cited. You are claiming that a rise to 4.2 degrees above the 1951 to 1980 mean is the same as a rise of one degree per twenty years. But it's not, is it. If you took the average rise from the start date in the chart (where it's approx zero anomaly) to 4.2 degrees above, that would be 0.42 degrees a decade, which would be 0.84 degrees every twenty years. If you take it that the zero represented the mid point between 1951 and 1980 - say, 1966 (giving you the half year) then it's 0.89 every twenty years - still not one degree every twenty years. Even if you took 1970 as the zero year Monckton might have used, but obviously didn't or he would have said so, you still don't get to one degree a decade. You only get as far as 0.93 a decade. In addition, as idunno and PL have pointed out, Monckton would have had to pretend that Hansen's scenario A was his most likely scenario. Which it wasn't. It gets worse. 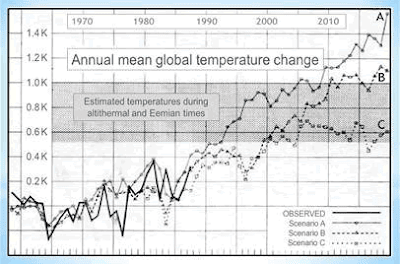 Monckton said the Hansen "implied" a six degree rise by 2100. Wrong again. If Dr Hansen had wanted to imply that back in 1988 he would have done so. He didn't. That's another fabrication. One can assume that Monckton meant a six degree rise above the 1980 temperature anomaly (120 years before 2100 at one degree every twenty years). Which would be a rise of 6.4 degrees or so above the temperature around the turn of last century. So, Epic Fail, you seem to have epic failed. Now that's not to say the temperature won't rise to six degrees above the temperature at the turn of last century by 2100. But as I've pointed out that's not the current thinking. That wouldn't be likely to happen until some time into the 2100s even if we keep adding CO2 to the air with no effort to reduce it. To add/clarify: Bodman and Karoly say the possibility of going past six degrees by 2100 is reduced. However the more recent paper by Sherwood et al raise the possibility again, when they say it's likely that a doubling of CO2 means a rise of three to five degrees in temperature - but I'm not sure if that's the immediate temp rise or the "in the pipeline" temp rise from doubling. I do know we're on track to double CO2 before 2100. Idunno (very much do you) PL you don't understand the point of my comment. 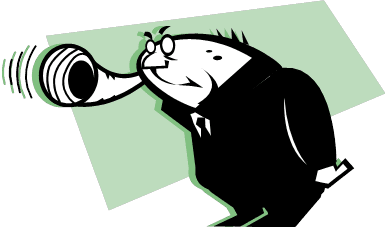 All very nice rants about this scenario or that scenario and whether it be linear or exponential blah blah blah, but totally irrelevant to the point. How Hansen came up with his scenarios or in fact his predictions is his problem, he could have made them up by reading tea leaves or analyzing his own belly button fluff for all I care, but the claim in the post was that Hansen had never predicted that the world would warm by 1 degree every 20 years. He did. It is in his paper. That claim is clearly WRONG. 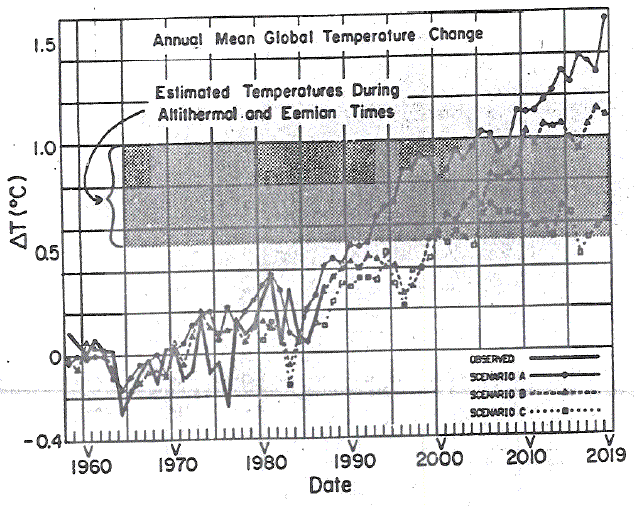 Sou, the graph clearly shows that in 1988 when the paper was written observed temp and his prediction are both at around 0.2C above the 1951-1980 mean and rises to 4.2C above the 1951-1980 mean by 2060, do the math. Predicting what has happened in the past is a very simple task so going back to an earlier time is a useless exercise. Even with your cherry picked dates you can still only reduce the prediction to 0.84C every 20 years. Once again you try to denigrate others by pointing out their errors, but in this case the error is all yours, why not just correct it? Maybe it's just me, but I seem to remember that Hansen testified that he thought scenario B was the most likely path. But it could just be that I'm old and forget things. Okay you're taking it from 1988. You could have said so from the start. In any case, Monckton was wrong - which was the point I was making in the article. Monckton was indeed wrong. Dr Hansen didn't tell Congress any such thing. He didn't say the world would warm by one degree every twenty years. Nor did he imply to Congress that the world would warm by "6 Cº to 2100". Even in his published paper he didn't imply that the world would warm by "6 Cº to 2100". He made no projection at all to 2100. If he'd wanted to imply that he would have done so. One thing James Hansen is not, is a shrinking violet. Others have already pointed out why your use of Scenario A is wrong. And this isn't "denigration"? "Perhaps that is due to lack of research skills" - when the points I made in the article still hold true! If you are trying to argue some other point that's not related to the article - do so. A lot has changed in the last thirty four years. A lot more is known about climate and a lot more is known about human emissions of various kinds. A lot hasn't changed, too. The basic science of the greenhouse effect is still "settled science". Dr Hansen, despite having very primitive tools by today's standards, and much poorer quality data at his disposal, was remarkably close in his projections. There wouldn't have been too many people at the time who were anywhere near as close to what's turned out in practice, taking all that he and his coauthors discuss in the paper into account. What were the fake sceptics predicting back in 1988 I wonder? What have some of them predicted just since 2001? Perhaps you would tell us your own global surface temp predictions to 2030, 2050 and 2100. After all, you have better hardware and software tools than Dr Hansen had at his disposal back in 1988. You have much better quality data at your disposal, thanks to the work of scientists, weather bureaux and others. Give us your best shot. Rattus - not in the record of oral or written testimony. This NY Times article could almost have been written this week. There's more knowledge of the detail, but global warming is still happening the same as it was back then, only it's a got a bit hotter in the last 26 years. Dunno where my 34 years came from. Age related senility I expect. It's 26 years since 1988. Why would you start from any other date? But not in your wacky world hey? apparently the predictions that Hansen made when he released his paper in 1988 can by some miracle start 28 years or any other date of your choosing before he made them. I wish the TAB worked that way, I would make a fortune. You are confusing predicting with hindcasting. Implying 6C to 2100. Are you suggesting that Hansen thought that it would warm by 1C every 20 years up until 2050 and the miraculously stop? His paper which included the prediction was cited in the printed material presented to congress. I've already pointed out that his scenarios are irrelevant his prediction is there in black and white. Doesn’t alter the fact that Hansen made the prediction that you claim he didn't. Who cares? That is an entirely different topic. you're straying from the topic again. Whether he believed it or not and how he came up with whatever scenario aside, Hansen did make a prediction in 1988 that temps would rise by 1C per 20 years out to 2060. Monckton accurately quoted that prediction. You were wrong when you said that Hansen had never made such a prediction. Perhaps I should refer you to the First Law of Holes. "Monckton accurately quoted that prediction." There is nothing accurate about what Monckton wrote. Actually *read* Hansen’s paper. He didn’t predict the world would warm by a specific amount: he provided three scenarios for growth in RF and said “based on my model, *if* emissions follow this path, *then* we should get this amount of warming”. The world did not follow Scenario A, so saying Hansen predicted warming that is consistent with Scenario A is a lie. The closest scenario to net emissions so far since 1988 is Scenario B. So, Hansen’s “prediction” is the Scenario B line. It is always possible we’ll get back on the Scenario A emissions path, somewhat equivalent to the new RCP8.5 path in AR5. In that case we’ll face more rapid temperature rise. It’s good to know what happens in the worst-case scenario, which is what we’d get if all the denier chorus actually won the day. Don't worry, you're not alone. Even Nobel prize-winning, Aids-curing, Aristotle- quoting polymaths such as Mr Monckton sometimes take 25 years puzzling over this, and still make the same mistake. Secondly, and this is a whole different level of complexity; conditional clauses. No, on second thoughts, lets not even go there. So, Mr Monckton has had 25 years to notice that global CO2 emissions have not followed an exponential path, in which case a comparison with Scenario A would be valid. They have followed closer to Scenario B, which is a linear path. Monckton and Michaels still apparently cannot understand this after 25 years of trying. Or they're not trying. OTOH, it apparently does worry you that Sou, in less than 25 hours, has not been able to guess that when Monckton refers to Hansen's 1988 Senate testimony, he actually means his 1988 co-authored paper. This, imho, is asking quite a lot of Sou, who seems to be quite hot on the science, but who is possibly not so hot at guessing the psychiatric implications of the emanations of what Chris clearly meant to say by saying something entirely different. Obviously. Here we are in 2014 and deniers are stuck in the 20thCE gnawing on Hansen's model and the Hockey-Stick, as if by taking them down they can make AGW go away. 13% of a century has blown straight past them, unnoticed. And still with no prospect of Anthony's peer-reviewed UHI paper, come to think of it. Has that been mentioned in the asylum recently, or has a discreet veil been drawn over it? His "draft report" has all but dropped off the WUWT sidebar. It's been slipping down for some time. Looks like it's a goner. "...the two dominant sources of bias in the U.S. temperature records are caused by changes to time of observation (spurious cooling in minimum and maximum) and conversion to electronic resistance thermometers (spurious cooling in maximum and warming in minimum). attention to which would remove his claims of "a spurious doubling", and hence completely negate his Sturm und Drang, I doubt that it's a high priority for him.